Danderyd is a small, leafy suburb, just north of Stockholm. Around 32,000 people live here. It is around 28 square kilometers that is bordered by Edsviken lake on the west that runs around the south end into the sea on the east side. There are flats here, with more being built as soon as possible to meet housing needs but most people live in houses. Many people commute into Stockholm to work - it takes just 10 minutes by tube or train. Most services exist here, such as plenty of schools and healthcare options but other services are shared with neighbouring Täby. Life in Danderyd started in late 2012 to share news and views of life here in the area in English. Now, in 2018, it attracts around 8,000 visitors each year, most of course from Sweden but also from across the world. 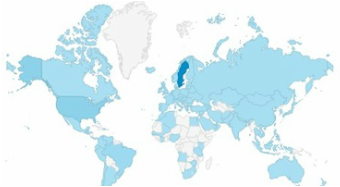 About a third of those visitors find the site by searching for 'Danderyd', 15% find it via our social media pages but most have been told about it by a friend, which hopefully means we are doing a good job. This website is home to the 'blog', where we publish articles and interviews. Our Facebook page is where we post most things, including local events and photos of things going on. It is the best place for keeping up-to-date with life here. Twitter follows Facebook and Instagram is a home for all the interesting photos that locals post. 'Where things are' is a directory of many of the businesses and services in the area and it is quite a challenge to keep it current! If you are new to the area or thinking of moving here, check out our sister site New in Danderyd and Sweden.